Maozhou Meng has completed undergraduate and postgraduate degrees in mechanical engineering, worked for the Chinese Academy of Sciences (CAS), written four journal papers (three published and one under review), and was a committee member of the annual conference of Plymouth Marine Science & Education Foundation. As an extension of his current study, and in collaboration with Professor Antonia Ferrari at the University of Porto – a ‘Santander Universidad’s Network Partners and institutions’ – Maozhou’s project enabled him to complete notable and fundamental research into step-change technologies for marine composites. "Since global warming has risen as a realistic issue, sustainable energy sources, such as marine tidal and offshore wind, will increasingly contribute to the energy supply. Composite materials are considered the key to the success of such energy devices." The awarding of the grant allowed Maozhou to develop numerical models, manufacture prototypes, and carry out tests in sea water environments. The award also allowed Maozhou to publish his research at international academic conferences, attending the 18th International Conference of Composite Structures in Lisbon after already having presented his work at the 10th European Symposium of International Network on Offshore Renewable Energy in Naples. Now, thanks to the powerful high performance computing technique at Plymouth University, Maozhou has effectively optimised the design of the composite joint for a one-megawatt class turbine. Maozhou is hopeful that his technological breath-through could generate electricity to approximately 1,000 houses. "The research could have a significant impact on the global environment by reducing fossil fuel usage and the emission of CO2." Having had the opportunity to collaborate with researchers in Porto and work alongside researchers from Italy, Denmark, Spain, and Ireland, Maozhou has returned to Plymouth University to complete his PhD. 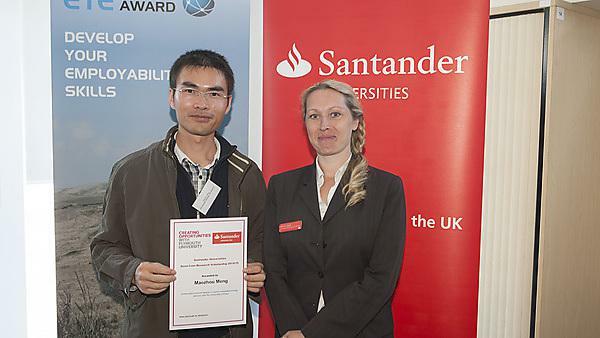 "With the support of the Santander Universities Seed-Corn Research Scholarship, I have been able to finish my numeral analysis and computer aid design for the one-megawatt class marine turbine. I am now currently working towards manufacturing a prototype."